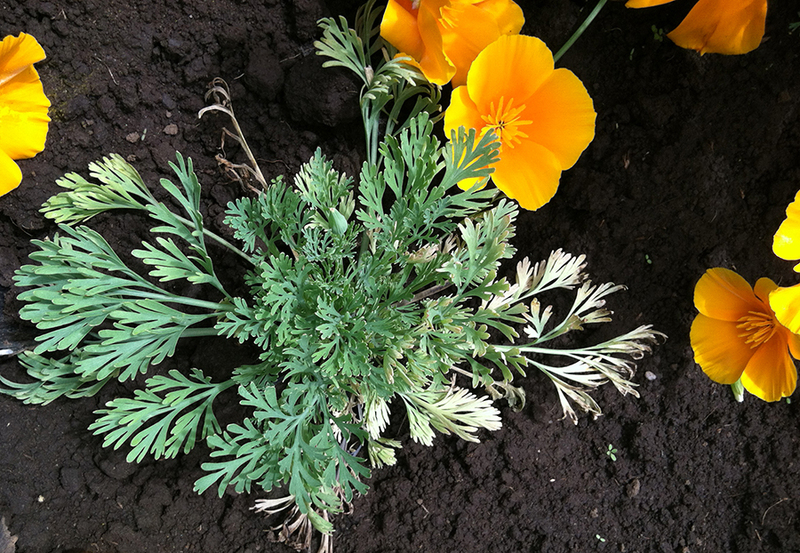 A California poppy plant exhibiting wilt symptoms due to Fusarium oxysporum; overall growth is retarded and foliage has taken on a blue-greenish hue along with lower-leaf death. Photo by Cynthia M. Ocamb, © Oregon State University. This handbook is intended as a ready reference guide to the control and management tactics for the more important plant diseases in the Pacific Northwest. No attempt has been made to include all of the plant diseases that could possibly occur in the Pacific Northwest. The specific cultural, biological, and chemical recommendations are intended to manage a specific plant disease but may not always be appropriate under all production circumstances. The synthesis of a specific management recommendation should be done by a qualified individual. For this reason, this book should be used by—and has been expressly written for—county Extension agents, consultants, field and nursery people, and chemical industry representatives. Growers also will find this publication useful but should contact their local county Extension agent or consultant for specific recommendations. Management of plant diseases is based first on an accurate diagnosis since plant problems can be due to environmental, physiologic, entomological or management problems, as well as plant pathogens or a combination of these problems. Organic growers will concentrate on cultural and biological control measures but should realize that many compounds listed under chemical control are “natural”—that is, not synthetically produced—and/or are permitted for organic production. These products are signified with an O and are based on the National Organic Standards of allowed substances for plant disease control (Subpart G – Administrative 205.601). Please check with your local certifying agency to verify what is allowed or regulated. Master gardeners and homeowners may find this publication useful. However, many of the compounds listed under chemical control are available only to licensed applicators. Compounds generally recognized as safe can easily be obtained at local garden centers and supply stores. Some of these materials in the “Host and Disease Descriptions” section of this book are represented by the symbol H. This symbol simply indicates that the same product or a similar product with the same active ingredient is commonly available in home packaging. Chemical and biological control recommendations are based on information available in December of the year preceding the year given on the cover of the handbook. Legal uses of many pesticides are changing continually. Changes may include de-listing a crop or site, different formulations that require different application rates, new restrictions on preharvest applications or reentry periods, and unique circumstances. For example, new fumigant labels were not available at this writing, which may have included new signal words (many changing to restricted-use materials), lower rates, buffer zones and reentry restrictions. Therefore, always read the current label before using any product. Although we have an extensive and useful index in the back of this book we are unable to create an index for all aspects of this book. Readers might find it more useful to do an electronic or computer search of this book. Please go to our website to conduct very powerful and easy search for any word of your choice. For example, pesticides are not indexed but could easily be found using the computer search engine. The website can be found at http://pnwhandbooks.org/plantdisease. Several color photographs of disease symptoms can also be found at this site. Information in this publication is in a state of constant change. New information is added and existing information is updated. With so many changes and people involved, there is always the possibility of error. We appreciate being informed of any errors that you may detect. Suggestions for improvement are welcome, also. We have worked to make this book responsive to the needs of the people who use it and will continue to strive for that in the future. The information herein is supplied with the understanding that no discrimination is intended and that listing of commercial products, necessary to this handbook, implies no endorsement by the authors or the Extension Services of Oregon, Washington, or Idaho. Criticism of products or equipment not listed is not implied or intended. Due to continually changing laws and regulations, the Extension Services can assume no liability for the suggested use of chemicals contained herein. Pesticides should be applied according to the label directions on the pesticide container.